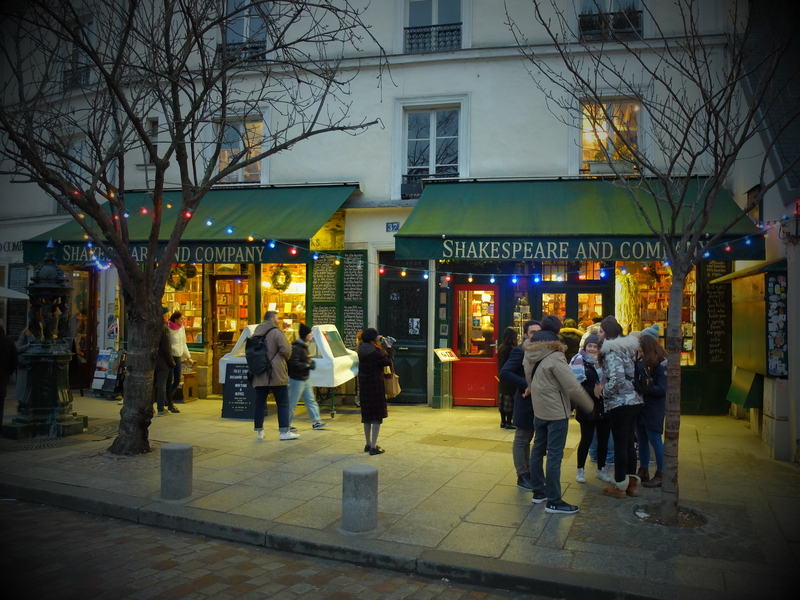 We spent five hours wandering the insanely frigid and wet streets of this beautiful city. I wore a beret, because that’s what one does here (with naturally curly hair that has been blown out). 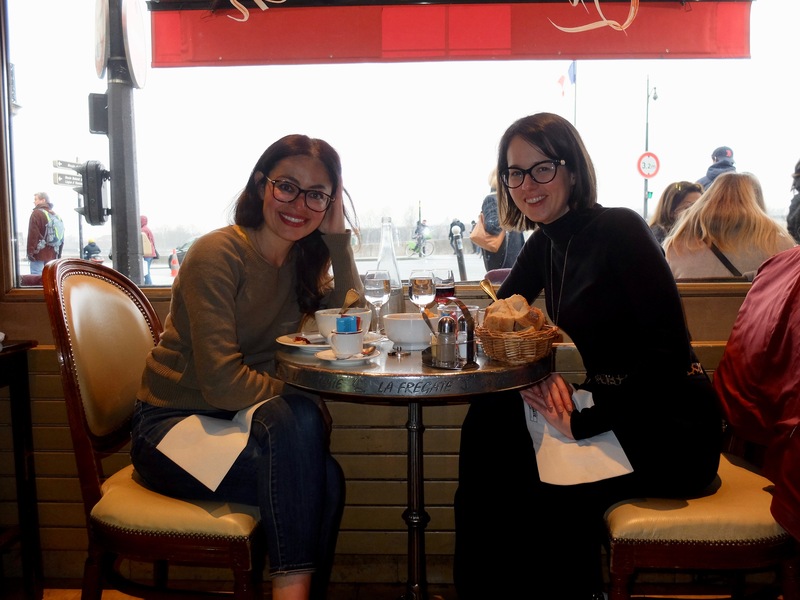 Primarily, we detoured around all of the yellow vests demonstrations, and landed at La Frégate brasserie where for one very quick split second, we considered sitting outside beneath the heaters and wrapping ourselves in the provided blankets. Then we walked in, felt the heat, and outside very simply went the way of the dodo bird. Onion soup, and french fries warmed us while a macchiato gave me much needed energy after the tundra had sucked everything I had to give. The second was when we asked the table next to us to take our photograph, the one above. Because we were back-lit, it was difficult to capture. 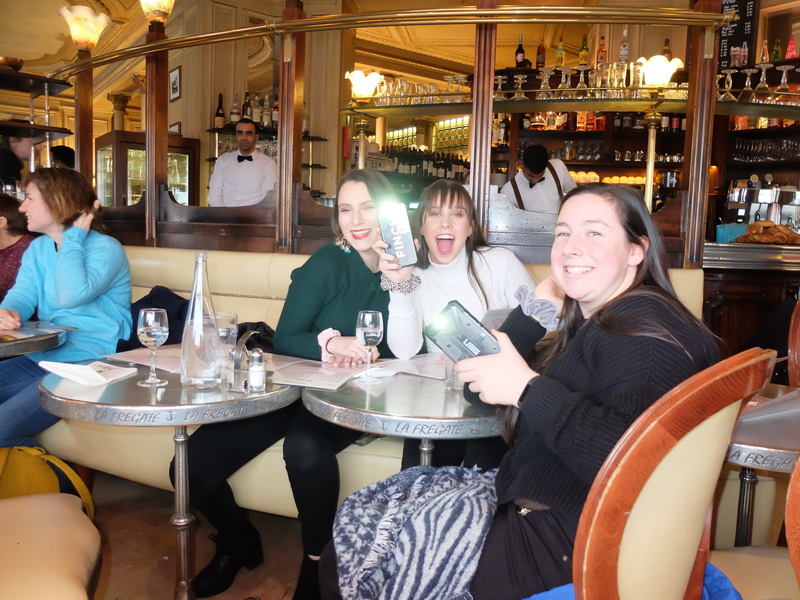 Suddenly, the two women not taking the photo pulled out their phones to light us up. 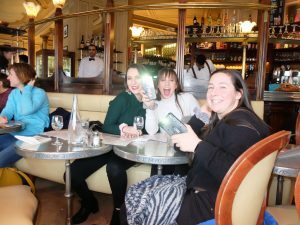 It was hilarious, and I hope these Aussie broads keep lighting their way through Paris. I can spend hours here. I could in fact live here very comfortably if it weren’t for humans. Because people are such schmucks. I usually always buy a local author, but I read so many French authors on the regular that I didn’t feel this was necessary. Instead, I picked up the first publication from my favourite author (and postcards). 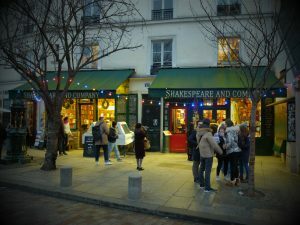 Wandering home through the 5e arrondissement proved as colourful as I had hoped. We ended our evening having dinner in pyjamas as home and I am now in bed listening to the pouring rain as it cozies up to my bedroom window; this, my favourite sound in the world. 1. Having such ready access to food. 2. Being able to take a shower and use a bathroom without the help of anyone else. 3. Knees and hips that let me walk for 5 hours without yelling at me.